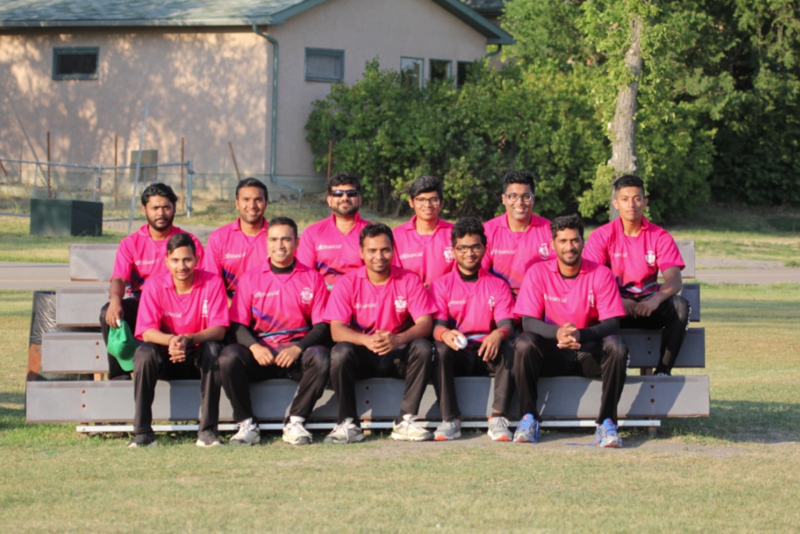 On Saturday morning, July 22nd, 2017, Cavaliers ICE took on Strykers in a 50 over first division cricket match at Douglas Park in Regina. Strykers won the toss and put the Cavaliers to bat first. ICE got off to a steady start with skipper Virendrasinh “Viru” Chauhan looking in ominous touch. Harshal Trivedi joined Viru at the fall of the first wicket and scored a magnificent 107 of only 76 balls, studded with 12 boundaries and 5 big sixes. A batting performance that lay the foundation for a big first innings total. A total of 400 looked likely at one point, but for a mid innings wobble. A vintage display of power hitting by Dhaval Patel, who made 48 of only 22 balls, propelled ICE to 354. TJ Singh and Viru continued their good form as both veteran batsmen scored fifties. The second inning started with Strykers coming out with all guns blazing! They scored 60 runs in the first 8 overs before Gavin Mian got caught in the deep, off a full toss. Strykers continued to hit boundaries but The Cavaliers continued to take a few more quick wickets. Eventually Sukjinder Gill and Sabih Fawad built a solid partnership and got the chase underway. After 30 overs, Strykers only needed 130 runs in 20 overs with 7 wickets in hand. The match seemed to be slipping away from ICE when seam bowler Dhaval Patel was introduced into the attack and he immediately got the big breakthrough wicket of Fawad, who fell just short of his century with 90 runs. Dhaval bowled 10 uninterrupted overs, completely turning the game on its head, and took his maiden 5 wicket haul in the process. ICE continued to leak runs at the other end until Viru trapped Stryker's top scorer Gill for 94. The match went to the wire as ICE held their nerve to sneaked through with only 25 runs. 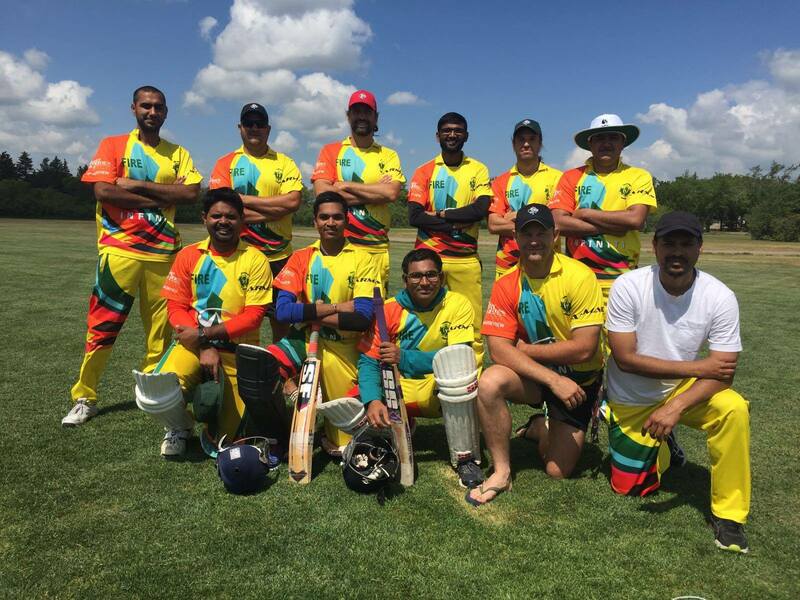 While their fellow Cavs were playing against Strykers, Cavaliers FIRE took on Regina Stallions in a “Regina T20 Cup” cricket match at Grassick Park. Stallions won the toss and elected to bat first. Thanks to aggressive fielding and very disciplined bowling by Cavaliers’ openers Joe van Heerden and Shwetank “Tank” Sawroop, Fire took two quick wickets and managed to restrict Stallions to under 30 runs at the end of the powerplay. Seamer Tanveer Paul got the breakthrough wicket when he got Stallions heavyweight batsman, Charanjit Randhawa, LBW for only 6 runs on the last delivery in the 8th over. After the fall of Randhawa’s wicket Stallions’ remaining batsmen just could not build any significant momentum. At the end of the first innings Stallions managed to only score 124 for 7. 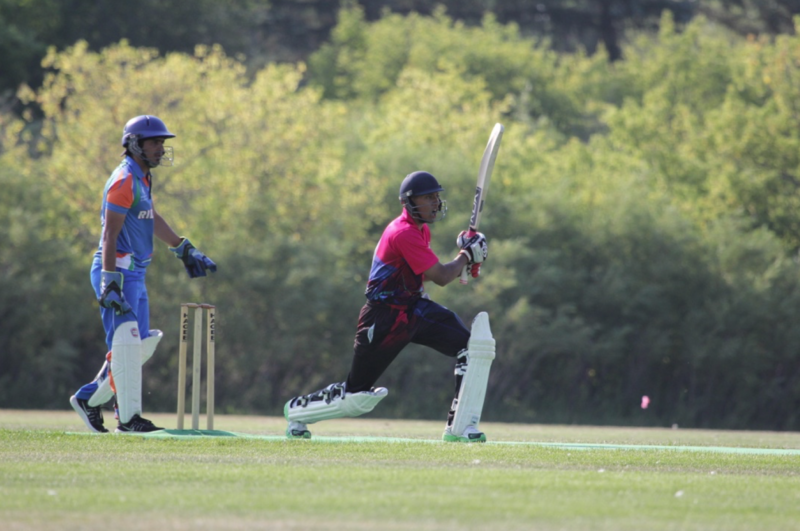 Knowing that 124 runs could easily be defended in a T20 match at Grassick Park, and knowing that FIRE has struggled of late to chase runs, captain Santhosh Veerabhadrappa emphasised the fact that FIRE needed to bat out their twenty overs in order to have a chance to win. “Just bat out the overs, and don’t give up your wicket, and we’ll have a good chance to win” said Skipper. That’s exactly what the boys did. Cavaliers openers Rajan Sagar and Chintan Patel did not allow their wickets to fall and managed to chased down the score in only 16.2 overs, with a display of confident, intelligent batting. Patel scored 63 from 55 deliveries, and Sagar scored 55 from 43 deliveries. The following day, Sunday July 23rd, Cavaliers FIRE took on Titans Tornado in a division two ODP cricket match at Douglas Park. Titans won the toss and elected to Bowl first. Rajan Sagar and Chintan Patel opened the batting for FIRE again, hoping to repeat their previous day’s performance. Although the pair got off to a decent start, the first wicket fell at the end of the 8th over when Patel got caught by Asher Rizwan off the bowling of Khuzema Rana. Sagar’s wicket fell less than two overs later. Cavs middle-order batsmen Johannes Sterrenberg and Tanveer Paul batted well and managed to pick up the run rate considerably, mainly to a few big sixes by Sterrenberg, who scored 33 runs of 19 deliveries, before his leg stump got dislodged by Sohail Munir. Paul continued to bat steadily and scored 39 runs by the time he got dismissed for LBW in the 32nd over. Thanks to tail-enders, Paramjit Singh and Santhosh Veerabhadrappa scoring quick twenties, FIRE managed to put up a defendable total of 212 runs before the loss of their tenth wicket in the 34th over. Like the day before, FIRE’s fielders and bowlers were firing on all cylinders and managed to bowl Titans out for 160 in the 35th over. The highlight of the second innings: Cavs spinner Mandeep Singh took a whopping 5 wickets for only 33 runs in his allotted 8 overs. Joe van Heerden also got rewarded for his overall good bowling this weekend, with 2 wickets for 39 runs in his 8 overs. 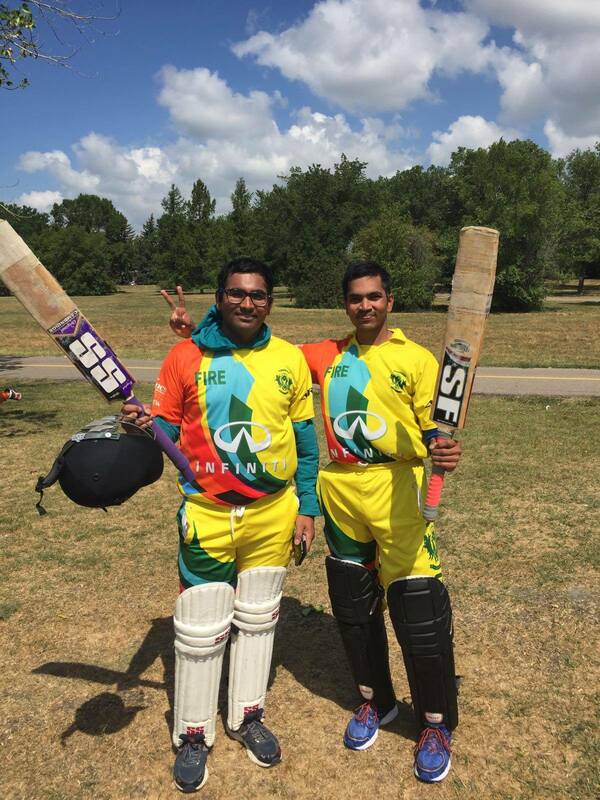 ICE’s second cricket match of the weekend was a T20 bout against Regina Armours (formerly Regina Riders) at Grassick Park . Winning the toss, and electing to bat ICE made an unusually sedated start against some disciplined bowling. Harshal Trivedi continued his good form from the day before leading the charge with another quick fifty. He was ably supported by Viru Chauhan who was unlucky to miss out on a bigger score, getting run out for only 26 from 15 balls. ICE ended with 189 in their 20 overs, a defendable total at Grassick Park. 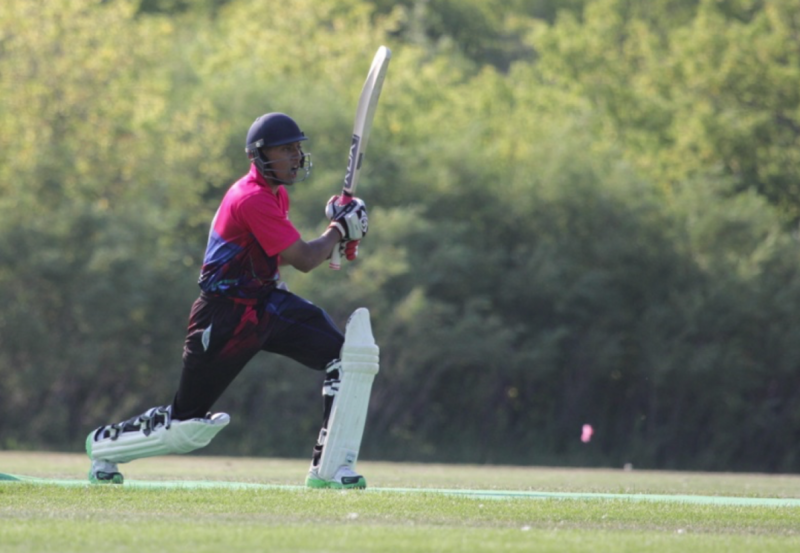 Regina Armours’ chase went absolutely nowhere from the start with only 2 batsman crossing double digits, one of them Nimesh Patel who went on to score an unbelievable century, hitting a 6 off the very last ball of the game, to get there. Seamer Chandan Parmar was the pick of the Cavaliers bowlers, picking up a solitary wicket in his hostile spell. Cavs skipper, TJ Singh, picked up 2 wickets. In the end Armours could only manage to score 142 for 6, in their allotted twenty overs.